DELRAY BEACH, FL. 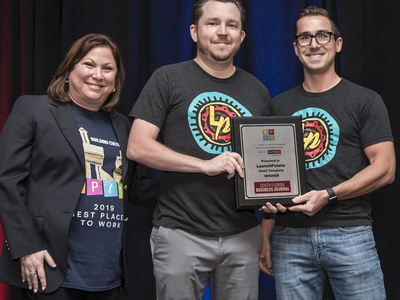 (February 22nd, 2019) — Launch Potato was awarded first place in the small business category by South Florida Business Journal’s 2019 Best Place to Work Awards. An anonymous quote from the employee survey reveals a bit more about what it is like to work at Launch Potato. "Launch Potato is truly an amazing company. The founders really care about each and every one of us and treat us all like people. They're not inaccessible people, who are just there as 'founders' they are just as much as part of the team as the rest of us. They want to know how you are, what you think and what they can do to make LP better not just as a whole but for YOU"
The South Florida Business Journal is the leading business news outlet covering Broward, Miami-Dade, and Palm Beach counties. Now in its 7th Year, the 2019 Best Place to Work Awards have honored some of the top companies who lead their industries in delivering business value and innovative cultures with a focus on employees. You can view the full article and company lists here. Launch Potato is a South Florida-based Startup Studio, founded in 2014 with no external investment and a mission to build and scale digital brands. Most recently a winner of the SFBJ Best Place to Work Award and named to the Inc. 1000 list for consistent revenue growth. Launch Potato is profitable with a portfolio of quickly growing digital brands that reach millions of consumers. Check out their careers page for open positions.